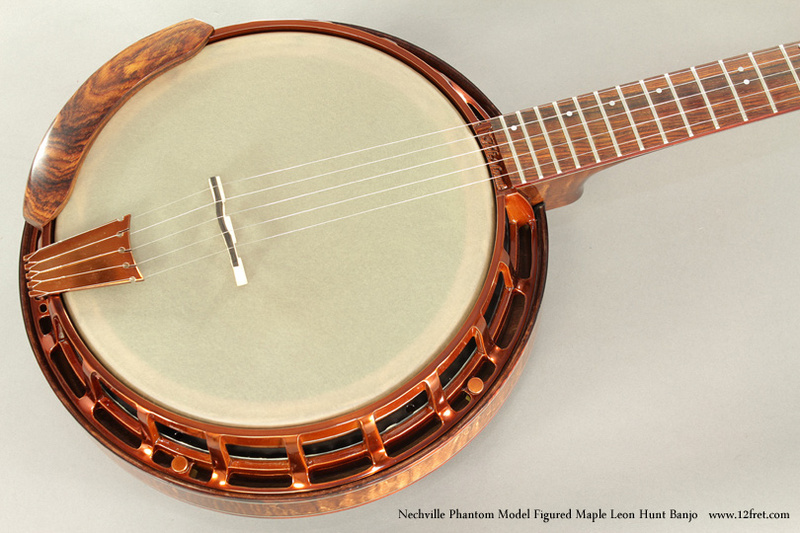 The Nechville Phantom Model Figured Maple Leon Hunt Banjo, while not a ‘formal’ Nechville model, is based on the Nechville Phantom XXV (Phantom 25). 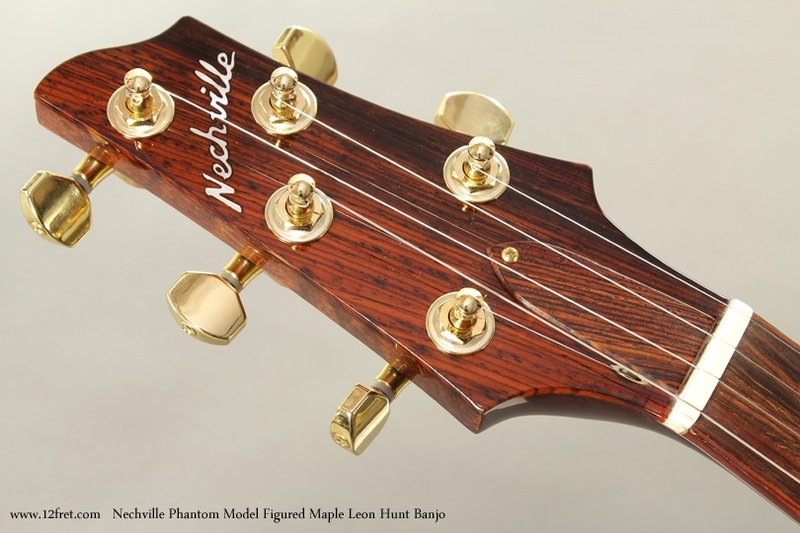 It uses all the Nechville Phantom elements plus very highly figured maple for the neck and resonator (rather than the stock figured walnut construction), with a slight walnut tint to the finish. 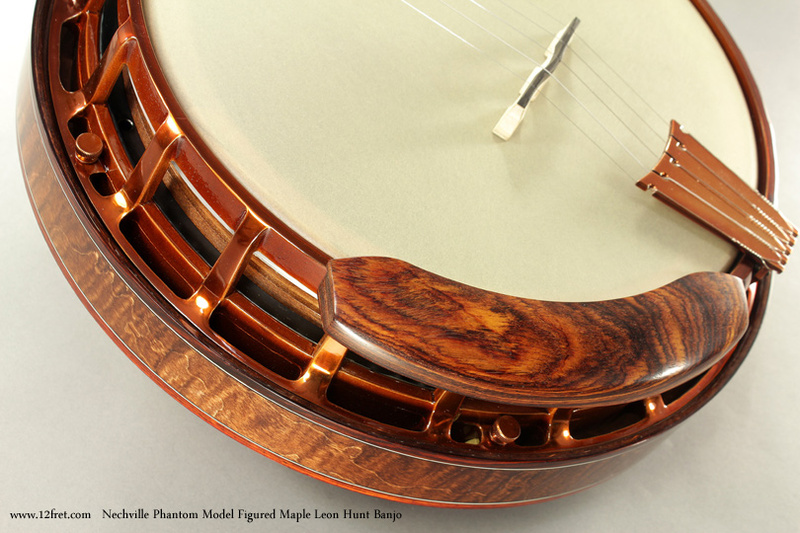 These spectactular banjos are made for The Twelfth Fret and are based closely on the Nechville banjo made for Leon Hunt. Nechville features include moving the 5th string peg to the headstock and using a ‘tunnel’ to run the string to the gear. This gets the 5th string tuner out of the way for all hand positions. The Leon Hunt 3-ply maple rim is fitted with a Nechville Timbr-Tronic wood tone ring, engineered from Cocobolo-wood and floating on a 9:1 ratio mix of steel and nylon ball bearings; an essential component of the Nechville Heli-mount / Cyclotronic system. The Cocobolo wood tone ring gives the warm, fat tone of the famous Nechville ‘Zeus’ model. The attractive copper finish on the metal components complements the warm ocher colour of the Cocobolo fretboard and is a custom-order finish done for The Twelfth Fret. 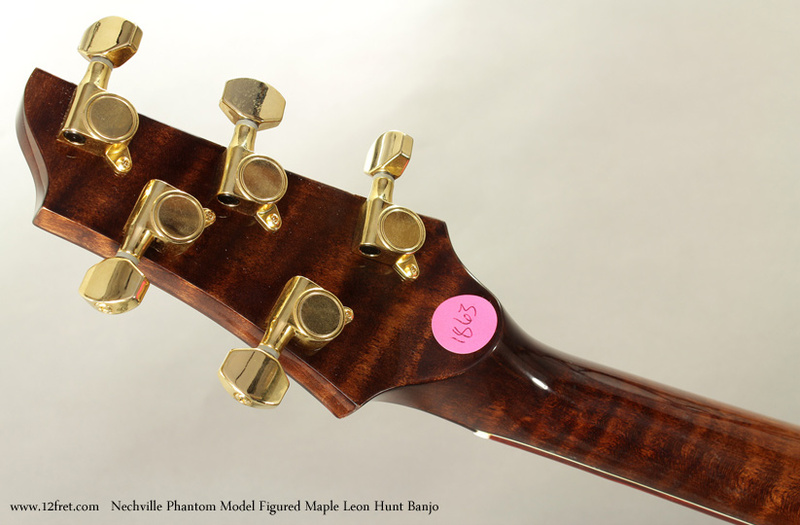 The tuners are gold plated and the arm-rest uses Cocobolo to match the fingerboard and copper finish. 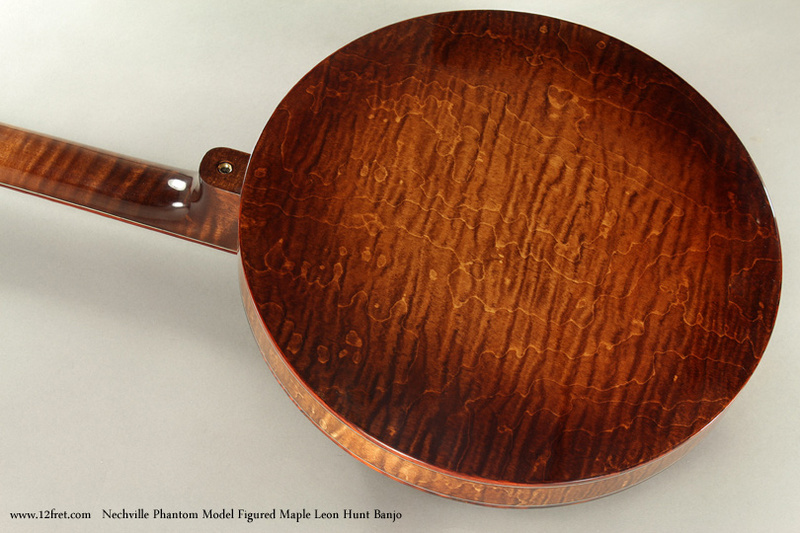 One subtle but effective feature of the Phantom ‘Leon Hunt’ model is light weight. The model shown weighs only 8 pounds, like a pretty average electric guitar! The Nechville arched top, hard shell case by TKL is included.